Did Trump and Putin agree to anything? 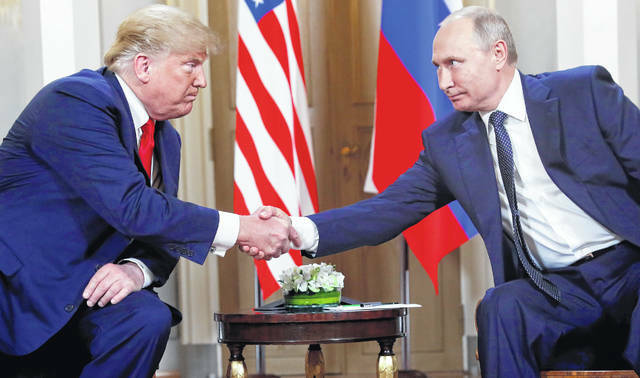 In this July 16, 2018, photo, U.S. President Donald Trump, left, and Russian President Vladimir Putin, right, shake hands at the beginning of a meeting at the Presidential Palace in Helsinki, Finland. Trump and Putin may have reached several historic agreements at their summit in Finland this week. Or, they may not have. Three days later no one is quite sure. With no details emerging from the leaders’ one-on-one discussion on Monday other than the vague outline they offered themselves, officials, lawmakers and the public in the United States in particular are wondering what, if anything, was actually agreed to.